TOP 5 Questions About Dental Implants – Answered! Traditionally, dental bridges and dentures have been the ONLY way to replace missing teeth. Then dental implants came along. In the beginning, the cost of dental implants was quite high, but like anything else, the process has become more straightforward and implants are now quite affordable. You’ve probably heard of Dental Implants, but want to know more about them before you make an appointment for an implant consultation. So let’s answer the 5 most common questions patients ask us about dental implants. 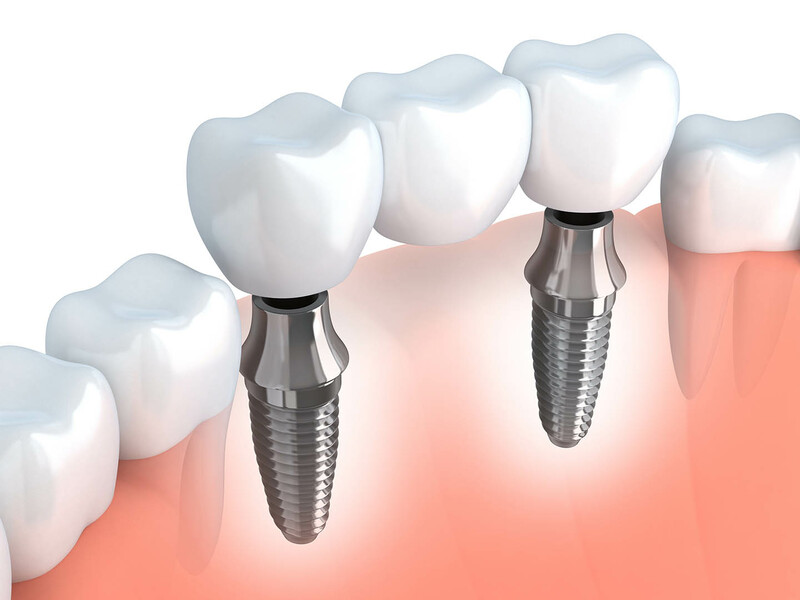 A dental implant is a titanium screw (similar to the root of a tooth) that is surgically positioned in the jaw bone beneath the gums, the implant allows the dentist to place a post (aka abutment) with a cap (aka crown) or bridge on it that feels and works like a tooth. Implants can also be used to stabilize a loose denture. 2. Are dental implants a good option for me to replace my teeth? If you are thinking about dental implants to replace missing or broken teeth you have to have good gums and jaw bone to support the implant(s). In the event your bone is too narrow, short, or soft you may require a bone graft to rebuild your bone so it is able to accommodate an implant. 3. Are there different types of dental implants? Yes! There are two types: endosteal (the most common) and subperiosteal implants. Endosteal implants are surgically screwed into the jaw bone, whereas subperiosteal implants rest on top of the jaw bone, but under the gums. Depending on the implant company, Implants can also be machined and shaped differently. 4. What is the implant procedure like? Following the initial evaluation and 3D CBCT X-ray, the dentist will determine if bone grafting is necessary and measure to see what size implant is appropriate for the area that you desire to have an implant placed. Once ready for implant surgery, a pilot hole is made to line up the location of the titanium screw and the titanium implant screw is inserted into the jaw bone. This is followed by a period of 4-6 months of healing. Finally, impressions of the implant are made so that a dental lab can custom-fabricate an abutment and crown that attach to your implant. 5. What problems can arise with dental implants? As with any medical or dental procedure complications can arise. Although dental implants are very successful, possible complications include: infection around the implant site, nerve damage or tingling sensation, pain to gums or teeth, or sinus complications from an implant that protrudes into the sinus cavity. Choose A Doctor You Can Trust! Christopher Green, DMD has taken advanced training in dental implants where he has gained the skills and experience to perform dental implant procedures from start to finish all at one office, conveniently located at 19551 Hess Road, Suite 100, Parker, Colorado 80134. Dental implants are a great option for replacing missing teeth or adding extra support to a loose denture. They feel great, look natural, and allow you to chew normally again. Call us today at 720-845-5252 and mention this article to receive a complimentary gift of $200 off an implant consultation or treatment. Or, for a virtual consultation with Dr. Green, click here and answer a few easy questions so we can better assist you.